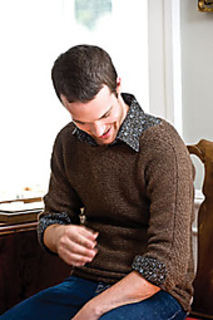 Available free in the e-book 7 FREE Knitting Patterns for Men. Log in & download the entire book for free. Finished Size: 40 (42, 44, 46, 48)“ chest circumference. 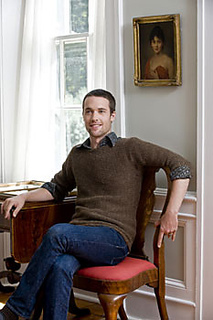 Sweater shown measures 42”, worn with minimal ease. Yarn: Cascade Ecological Wool (100% wool; 478 yd 437 m/250 g): #8087 brown, 2 (2, 2, 3, 3) skeins. Needles: Size 10½ (6.5 mm): 32” circular (cir). Adjust needle size if necessary to obtain the correct gauge. Notions: Stitch holders or spare cir needle; tapestry needle. This sweater is worked with a one-piece construction and unfinished edges for a raw, deconstructed look. If desired, finish neck edge with a single row of reverse single crochet or by picking up stitches all around, working in stockinette for ¾“, and binding off loosely for a roll-neck collar. Work moves from the right-sleeve cuff, to the body, to the front and back panels in separate pieces, to the rejoined body, down to the left-sleeve cuff. 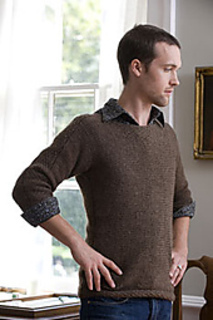 Work linen-stitch portions loosely and block carefully to maintain gauge over pattern changes.